Members of the European United Left-Nordic Green Left and Latin American intellectuals showed their support of Venezuelan people’s right to self-determination. 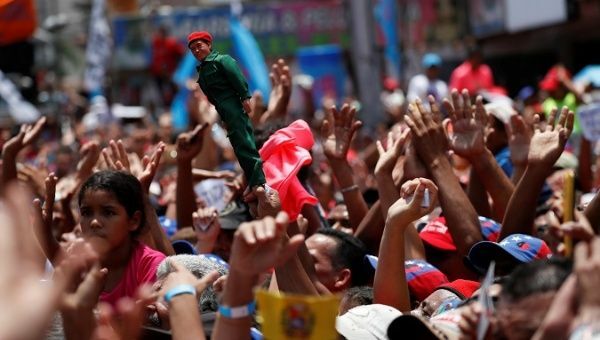 May 17 (teleSUR) Intellectuals and lawmakers of Latin America and the European Parliament have expressed their support for the upcoming Venezuelan electoral process, demanding respect from the international community to the right of the people to decide on their own government. “Not long time ago, there were military coups to impede citizens from voting. Today, the ones giving democracy lessons to the whole world are trying to stop that democracy. Even though they don’t like it, Venezuela will vote. That is, Venezuela will decide,” said Javier Couso, member of the United Left coalition of Spanish left wing parties and lawmaker at the European Parliament (EP). Venezuela will hold presidential and legislative council elections on Sunday May 20, in which two presidential candidates will try to replace incumbent Nicolas Maduro in office. But despite the fact that the Venezuelan electoral system has been praised by several international observers and it has the approval and trust of the opposition candidates, mainstream media and right-wing governments all over the world are calling the elections a fraud before it even takes place. “From the European Parliament, the Portuguese communists express their solidarity with the Venezuelan people. The people have the right to decide free from exterior pressures, free from interventions and maneuvers trying to hamper the Bolivarian revolution,” said lawmaker Joao Pimenta Lopes, member of the Portuguese Communist Party and of the Confederal Group of the European United Left-Nordic Green Left at the EP. “The Boliviarian revolution will keep on with its democratic process. United as one people we will be victorious,” Pimenta added. And from the Americas, intellectuals and lawmakers have also expressed their support for the Venezuelan electoral process. Hector Bejar, professor at the National University of San Marcos and columnist in Peruvian and international press, said in Peru people is closely following the Venezuelan electoral process, and reaffirmed Venezuelan people’s right to self-determination. “We’re with you, Venezuelan comrades, because we know that you are united as one people fighting for Venezuelan sovereignty. The whole Latin America is with you because the sovereignty in Venezuela is also the sovereignty in Latin America,” said Bejar. And Florencia Saintout, member coordinator of the Citizen Unity Block at Buenos Aires’ Lower House, expressed her hope for peace and respect for Venezuelan democracy. “Men and women of good faith know that peace, respect for democracy and respect for the self-determination of the peoples will allow us to build a future together. Venezuela has the right to decide. We’re with democracy, we’re with Venezuela, united as one people,” said Saintout. The president of Venezuela’s National Electoral Council (CNE), Tibisay Lucena, has multiple times reiterated its rejection of attempts by foreign governments at interfering in the presidential elections scheduled for May 20. “The CNE never ceases to be surprised at how some governments have such gross interference in Venezuela’s internal politics and seek to create tensions,” Tibisay Lucena told teleSUR. Recently, Canadian authorities said they will not allow Venezuelan embassies or consulates in the cities of Toronto, Ottawa or Vancouver to install polling stations. “They denounce that there is a dictatorship in Venezuela, but who is denying the right to vote? Only dictatorship countries do not allow citizens to exercise their right to vote, so I ask if Venezuela – according to some world nations – is a dictatorship, how is it that today Canada intends to curtail the right to vote of Venezuelans?,” said Jorge Arreaza, Venezuelan foreign minister.